Everything had a first version: here you can find it! Features: Wikipedia is a free online encyclopedia with the aim to allow anyone to edit articles. The name "Wikipedia" is a portmanteau of "wiki" (software that provides collaborative modification of its content and structure directly from the web browser) and "encyclopedia". Wikipedia was initially conceived as a feeder project for the Nupedia, a free online encyclopedia born ten months earlier. 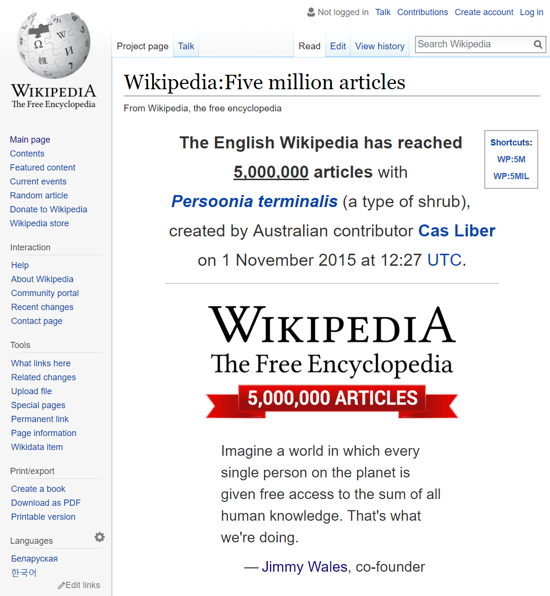 The idea of creating a publicly editable encyclopedia without an editorial process (unlike Nupedia), combined with the new strategy of using the wiki platform, was the key to its success. In January 2001 Wikipedia was launched as a single English-language, and its early contributors came from Nupedia, Slashdot postings, and web search engine indexing. Early in Wikipedia's development, it began to expand internationally, with the creation of new namespaces, each with a distinct set of usernames. 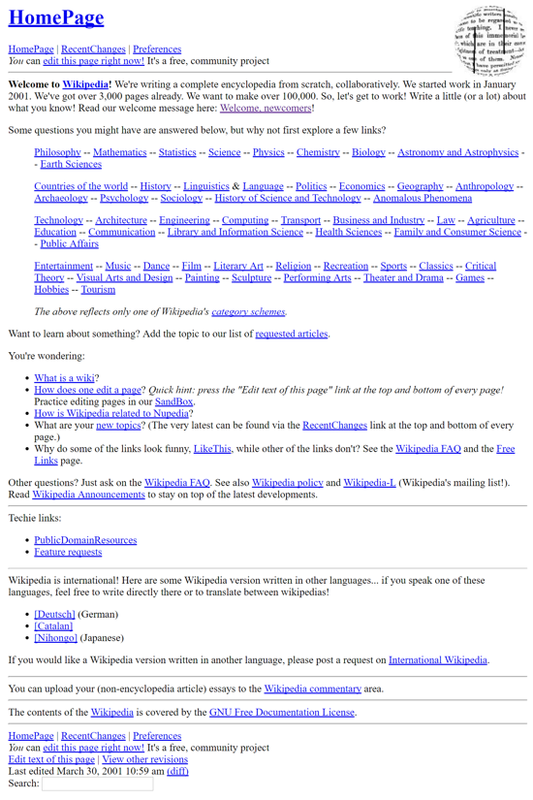 The first subdomain created for a non-English Wikipedia was "deutsche.wikipedia.com" (March 16, 2001). By the end of 2001, Wikipedia had grown to approximately 20,000 articles and 18 language editions. Interesting facts: In 1996, American internet entrepreneurs Jimmy Wales (later Wikipedia's co-founder), Tim Shell, and Michael Davis founded Bomis, a web-advertising portal. In 2000 Jimmy Wales hired Larry Sanger (later second Wikipedia's founder), a graduate philosophy student, to help him develop the first project about a free online encyclopedia built by volunteers: Nupedia went online in March of that year, supported by Bomis' resources. 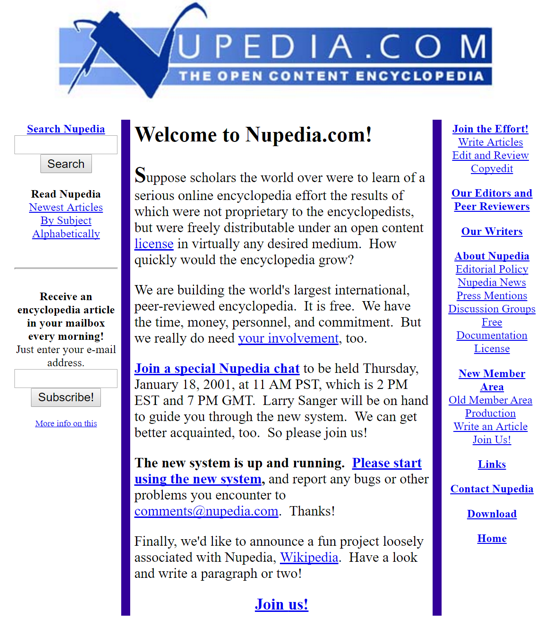 Nupedia was characterized by an extensive peer-review process, designed to make its articles of a quality comparable to that of professional encyclopedias; so Wales and Sanger discussed various ways to create content more rapidly. A computer programmer named Ben Kovitz suggest Sanger to introduce the so-called "wiki" platform, a software that allows publishers to contribute simultaneously and incrementally. In five days: this new project was proposed on the Nupedia mailing list, Sanger gave it a name, domain names ".com" and ".org" were registered, and on Monday 15 January 2001 Wikipedia was formally announced. Two days later an appeal for volunteers to engage in content creation was made by Sanger to the Nupedia mailing list, and the project began to receive its first participants. Slogan (2001): «The Free Encyclopedia"
Wikipedia, first announcement on the home page of its predecessor Nupedia (January 17, 2001). «Finally, we'd like to announce a fun project loosely associated with Nupedia, Wikipedia. Have a look and write a paragraph or two!» Nupedia, launched on March 9, 2000, had a seven-step approval process to control content of articles before being posted, rather than live wiki-based updating, and authors were expected to have expert knowledge. Before it ceased operating (September 26, 2003), only 25 articles were approved and published. 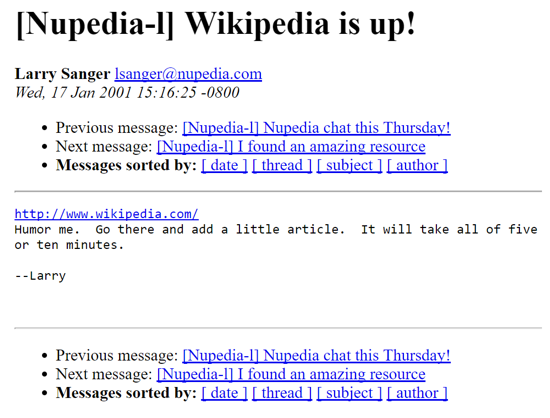 Wikipedia, announcement by co-founder Larry Sanger on Nupedia mailing list (January 17, 2001): «Wikipedia is up! http://www.wikipedia.com Humor me. Go there and add a little article. It will take all of five or ten minutes. --Larry». Wikipedia, first two logos (2001, left January, right December). Wikipedia's first logo was an image that was originally submitted by Bjørn Smestad for a Nupedia logo competition which took place in 2000. The logo included a quote from the preface of "Euclid and his Modern Rivals" by Lewis Carroll. The second logo was chosen in the first Wikipedia logo contest, which took place from November to December 2001, from a list of 24 leading candidates: the winner was an image contributed by user The Cunctator, which included a quote from Thomas Hobbes's "Leviathan", Part I, Chapter VI. This second logo was adopted from December 12, 2001 to September 26, 2003, when the English Wikipedia switched to Paul Stansifer's contest-winning "puzzle ball" logo.